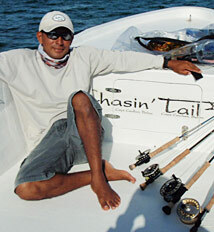 Chasin Tail is a locally owned fly fishing guided charters by Kenan Coc, better known as "Ken", a licensed guide and captain with over 15 years experience. 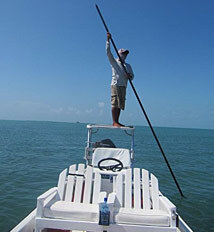 We provide professional services in saltwater fishing expeditions. 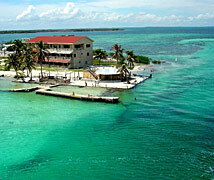 If you have come to Caye Caulker for a family fun trip or are a serious angler, we cater for every charter's expectations and welcome all to this fishing experience of a lifetime. Whether you are a veteran angler, a beginner and want to experience catching a permit, tarpon or a bonefish on a fly or a spinning reel and looking for a patient introduction to the sport, we can accommodate you. 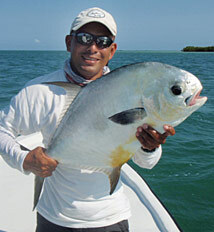 Permit fishing has become a unique challenge to saltwater anglers these days and many of our clients boast their first permit ever caught with us. We offer year-round fishing charters sight-fishing hunting for permit, tarpon and bonefish in addition to that we also do deep sea fishing. We offer a great opportunity to fish for large schools of fish which include jack trevalle, barracudas, groupers and snappers which are among the species of fish that are optional to keep for dinner. Make sure you ask the guide if you want to keep them. Kenan knows where to fish, his ability to sight-fish for permit, tarpon and bonefish on any given day will make your trip an enjoyable and relaxing experience where a grand slam is always a possibility. Our goal is to make you time on the water worth the while with us and yet you will have a productive day meanwhile developing a guide to client friendship leading to our ultimte goal our hope is to exceed your expectations and keep you coming back to Caye Caulker for more of our great fishing adventures. Chasin Tail, Caye Caulker, Belize Copyright © 2019. All rights reserved.